The sector expanded at the fastest rate since early 2008 after recording seven consecutive months of growth up to November, data from the Office of Nation Statistics (ONS) reveals. Industrial output rose by 0.4 per cent in November alone, contributing to a 1.2 per cent rise in industrial production — a measure of output from manufacturing, energy, and mining industries — in the three months to November. The three-month average of growth was the largest in nearly a decade. Britain’s trade deficit shrank in the three-month period, and in the year to November export growth outstripped imports by 0.8 per cent and the value of goods exported to non-European Union (EU) nations increased by £2.3 billion. The National Institute of Economic and Social Research (NIESR) has also changed its GDP growth estimates to 0.6 per cent for the final quarter of 2017, up from 0.4 per cent in the previous three months. 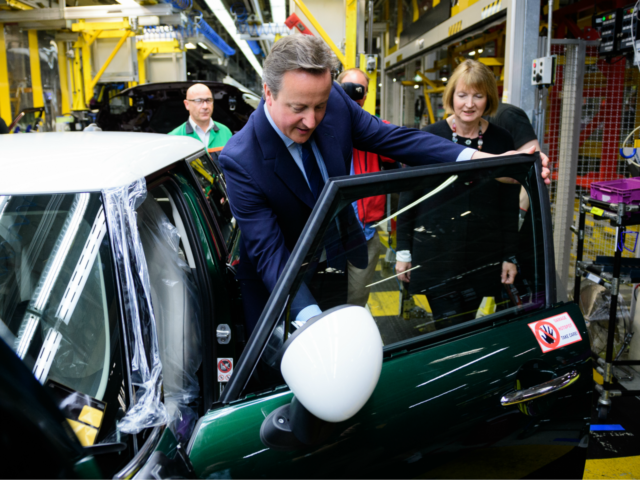 Ahead of the Brexit vote, then Prime Minister David Cameron attacked a Thatcherite economist, claiming he wanted to see the “manufacturing industry in our country obliterated” due to his support for Brexit. Amit Kara, Head of UK Macroeconomic Forecasting at NIESR, said that a weaker pound – which fell after the Brexit vote – was a factor in the growth, but added that construction was not faring so well. “Economic growth has picked up in the second half of 2017 after a period of subdued growth in the first six months,” she explained in a statement. In May 2016, David Cameron said at PMQs that voting fot Brexit would "obliterate" Britain's manufacturing industry. The biggest contribution to the manufacturing surge came from energy supply, increasing by 3.2 per cent. UK Independence Party (UKIP) Small and Medium Size Enterprises Spokesman Ernie Warrender commented: “This is great news for the country at large, and yet again nails the lie that UK plc is being damaged by Brexit. “However, to capitalise on the good news and to ensure prosperous and pro-active ongoing success for manufacturing, more governmental support and investment is needed if we are to maintain this growth in the all-important emerging industries. “It is vital that we provide greater access to more high-quality apprenticeships, fairer access to government contracts for British SMEs.